Beautiful brown beads made using glossy opaque light brown glass. These earthy handmade lampwork glass bead have a deep rich color with a shiny glass bead finish. 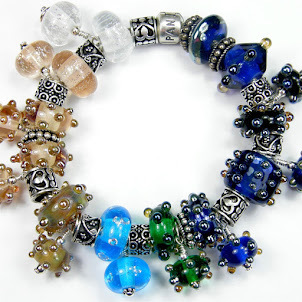 These beautiful beads can be found in my Brown Beige Taupe Glass Beads section in my Covergirlbeads Artfire Store. Beautiful brown beads made using glossy opaque dark brown glass. These earthy handmade lampwork glass bead have a deep rich color with a shiny glass bead finish. Etched transparent dark amethyst purple handmade lampwork glass beads wrapped with .999 fine silver. These gorgeous beads are made using transparent dark amethyst glass. This purple color reminds me of delicious mouth watering deep dark plums. You can see a hint of deep rich amethyst but it actually looks rather opaque as does the surface of the plum. They appear as an almost dark purple black. The purple color is a rather intriguing color to me. I added a splash of .999 fine silver wrapped around the middle of the beads creating a shine against these dark plum beads. They have been etched for a frosted sea glass or beach glass bead finish.